We enjoyed a few days in the beautiful city of Vancouver. We had a warm welcome from Jerome Charbonnet from the Swiss Consulate and journalist Christof Marti from the Vancouver Sun. Unfortunately the teachers were on strike and so we could not go and visit schools. It was great to meet Gordon who lives next to our anchorage just downtown. He was like an angel and showed us around. 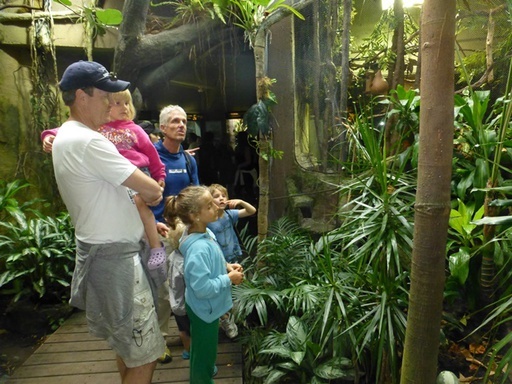 We visited some of the parks, the aquarium and Science World. For Meret it was time to say good-bye and go back home. Thank you so much for your time, we all miss you. We finally made it to the Head Office of Arcteryx, our very first sponsor since the beginning in 2000! It was for us a very emotional moment. 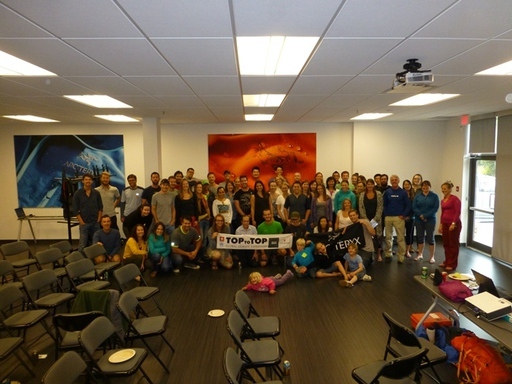 We gave a presentation there and felt very thankful having Arcteryx as our outdoor gear sponsor. Thank you Joanne for organizing the visit! From Vancouver we sailed to Thetis Island where Quentin also had to leave the boat. Many thanks to Quinten, we miss your bread! We had a look at the Thetis Island Marina where Paul offered us a space to leave the boat over winter. The people were very kind and the island was nice. Many thanks to Michel and Linda for your self-made jam and juice for the trip South! We needed to make a decision how to continue the expedition which wasn't easy. It took us several days of thinking and discussing the different options. Finally the decision was made. On September 5 at noon, we left the island in order to sail to San Francisco and start cycling from there. 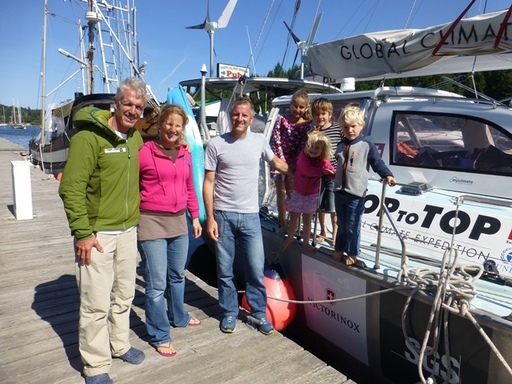 Overnight, we passed the Strait of Juan de Fuca and reached the open sea the next morning. The first couple of days the wind blew rather weak but then fortunately picked up and Pachamama speed down the US-Coast with a max of 16.6 knots (record)! 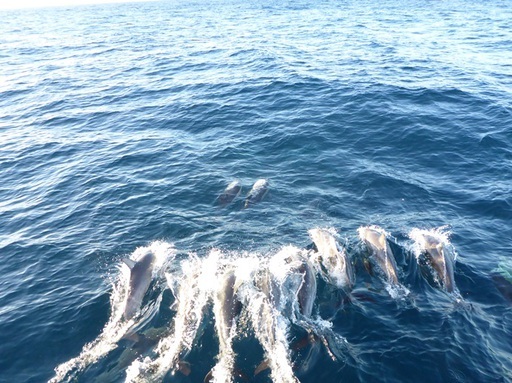 During this journey we were accompanied several times by different kinds of dolphins. Once we spotted a swarm of tuna fish so we decided to put a fishing line out on the back of the boat. A moment later a fish bit but managed to escape again. The disappointment for the kids was big. Luckily we got another chance. We had a second fish on the hook and this time it stayed. We were able to pull a 30 pound tuna on board. The next few days we ate tuna steaks, pasta with tuna sauce, tuna salad... It was very delicious and nice to know the origin of our food. 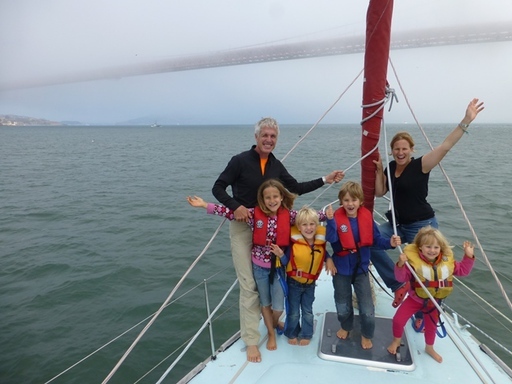 On September 11th, we sailed underneath the Golden Gate Bridge and entered San Francisco. At the Emery Cove Yacht Harbor we were welcomed by old sailor friends Anne, Kara and Uwe. Elsbeth with her two grandchildren also came to visit us, what a surprise. 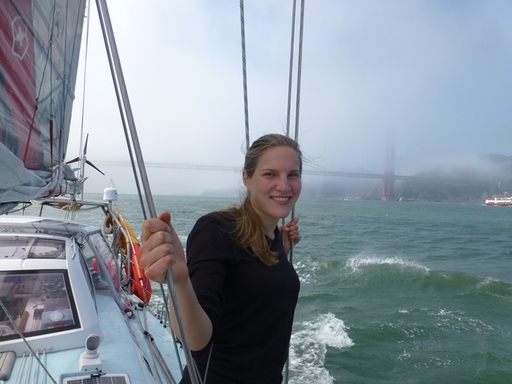 San Francisco is the last stop for Anja on our expedition. Thank you for teaching our kids. We hope you come back! The rest of us together with new volunteers are continuing the journey by bike to Death Valley, the lowest, hottest and driest part of North America after climbing Denali, the coldest, highest place. On our way we are going to visit schools to motivate the children to do something positive for our planet.